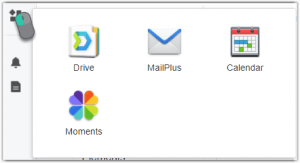 Moments – one of two photo management apps from Synology – was released in Q4 2017, as a companion app to Synology Drive, as part of Synology’s attempt to provide their private cloud users with capabilities to match their mighty public cloud rivals, Google and Microsoft. They have made a good start. As a “high-end” home user I am able to use Synology Office to create and share documents, sheets and slides from my DiskStation. But it is still early days and though most of the basics have been covered, it’ll be interesting to see how Synology up their game by issuing new releases of these products. The Synology Office modules may currently lag behind, but their two photo apps are at least as good as their rivals. Synology position the two apps for two markets, personal and professional – two ends of a spectrum. Photo enthusiasts sit somewhere in the middle, so which app is better for them? Here’s how Synology describe the two apps. Gather all your photos and videos in one private place and organize them in an entirely new way. Synology Moments opens a new era for photo storage, allowing random photos to be automatically sorted by an image-recognizing technique that can identify the people, subjects, and places in the photos. Build a personal gallery to showcase your photography online. They make a clear marketing distinction between the two apps. And there’s a pretty clear product management distinction too as there has been no significant new or improved Photo Station functionality for two years, while Moments has moved on quickly since its introduction in Q4 2017. With the arrival of a shared library, the lines between Moments and Photo Station are becoming blurred. Perhaps the lack of Photo Station improvements is because the developers have been concentrating on Moments? Or is the writing on the wall for Photo Station? I’d like an app that’s easier to set up and run than Photo Station but with a UI that is more attractive, and that makes sharing easier too. This makes Moments appealing, even if it is not targeted at photo enthusiasts, and I look forward to each Moments release in the hope that this will be the one where I can switch apps. What's new in Moments version 1.2.0-0638? 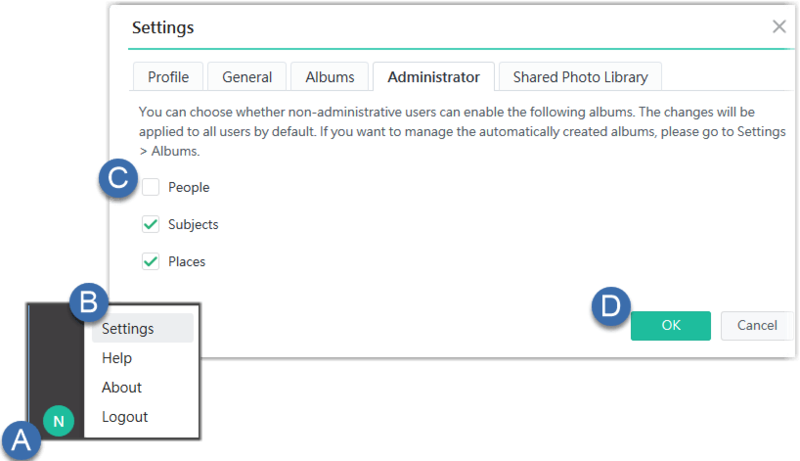 Shared Photo Library, allowing admins and authorized users to collaboratively edit the photos and albums in there. 360-degree photo and video playback. Editing the tags of multiple photos at the same time. Shifting the dates and time intervals of multiple photos at the same time. Integrated Intel Computer Vision SDK to facilitate image recognition performance on Synology NAS that has Intel processors from xl5 series onwards. Supports the map source Baidu to display photo location when viewing a photo in full screen. This is the headline item. 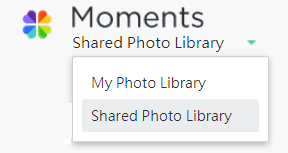 [thumbsup] Synology now allow the existing /photo share (that Photo Station depends on) to be added to Moments. Authorised users get a drop down where they can switch between libraries. It’s a sticky setting too which is useful if you don’t want to use a personal library. That toggle is also available in Moments’ mobile app, although it’s not so prominent as it is in the browser version. [thumbsup] Content can be moved quickly and easily between the shared and personal folders1. This means that individual users who sync mobile devices to their personal library can share their favourites with everyone. A system admin can also do that by simply copying content from the user’s home folders using File Station. 1This is a two-way street. Given that they clearly have access to the shared library, the use-cases for a user copying content from the shared into their private library are unclear. Potentially that will cause problems e.g. a user copies a file into their personal library, forgets it was sourced from the shared library, and copies it back there. 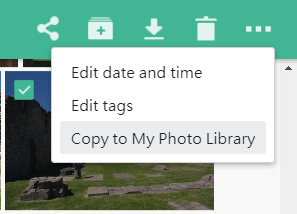 [thumbsdown] Content moved from a personal to the shared library is placed in a folder bearing the user account name, in the root of the /photo share, so anyone who uses an app such as Lightroom or Daminion to manage their library will need to add each new set of folders to their library. 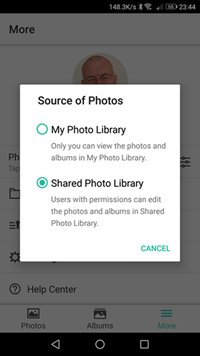 [lightbulb] I would prefer to place shared personal content inside the existing Pictures subfolder of /photo, in which my main library is located so that my photo library manager picks up new additions automatically. [thumbsup] Because the two apps share a set of folders you can run both apps on the same folders, which means you can do a really soft transition to Moments if that’s your chosen direction. “Draft” content that has been uploaded but awaits cropping, colour adjustments and tagging is “released” before it’s ready. [thumbsneutral] Good progress – but a few tweaks are needed to give more granular control over the folders in the /photo share to avoid duplicates. [thumbsup] It’s good to see this, although this has not been an area I have been interested in. Perhaps now is the time to start. [thumbsup] Great to see this capability because previously if you made a mistake you could not correct it. 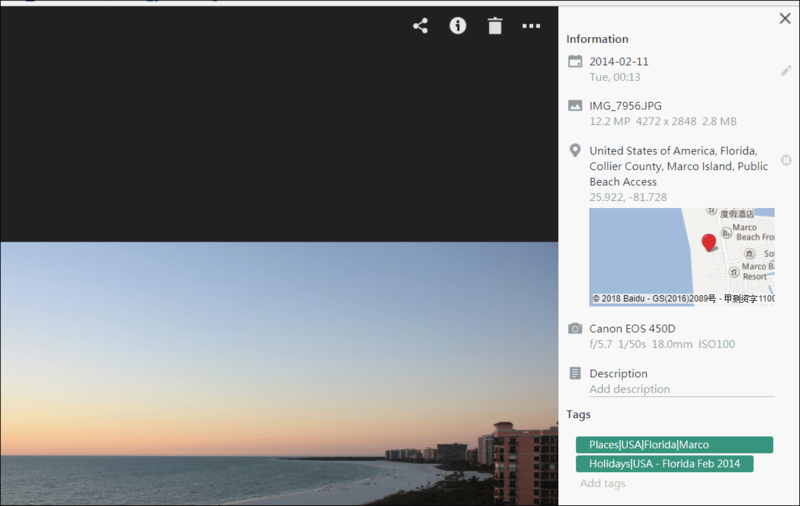 … but it doesn’t address the even more important issue that when you are tagging tens or hundreds of thousands of images and potentially thousands of tags you need decent tag management tools, including the ability to categorise similar tags. [thumbsup] Another must have for photo enthusiasts, because even the most well-organised photographer occasionally gets back from an overseas trip to discover they forgot to set their camera to the local time zone before they shot 50GB..
… to facilitate image recognition performance on Synology NAS that has Intel processors from xl5 series onwards. [thumbsdown] My 916+ 8GB has an Intel Pentium processor but still took 36 hours to catalogue my 25K images. Underwhelming..
[thumbsup] Another valuable feature for large libraries allowing you finer control over their display. … to display photo location when viewing a photo in full screen. [thumbsdown] I am not sure what the driver was for this change but given Google’s inexorable shift to charging for the use of Google Maps, an alternative mapping source is no bad thing, and it seems to work almost as well. … and while I understand Baidu’s origins, the presence of pictograms all over the map is not useful to me and obscures map detail. Some localisation is required. [thumbsdown] In the previous section we learned about the Intel SDK that Synology on Intel based DiskStations to drive Subject auto-tagging. Auto-tagging is a big deal at the moment with all the big players deploying AI tools to analyse image content to catalogue an image library. And that should be good for photo enthusiasts because large libraries need organising. If automated tools can spare us from the effort of manually tagging our content then that’s great. It’s a work in progress, with a long way to go. Synology’s attempts are no worse than the big players. Nor are they any better. It’s simply that these technologies have little to offer the photo enthusiast – yet. I mentioned earlier that my 916+ 8GB took 36 hours to process 25K images. That amount of processing to generate practically no useful results simply can’t be justified. Here is how things stand with People, Place and Subject auto-tagging. [thumbsdown] The FR engine in Moments is much better than Photo Station’s. That’s not setting the bar very high, because Photo Station’s is bad. However, in this release, Moments’ FR speed and accuracy have improved so let’s hope that trend continues. However much FR improves, it will always fall short of photo enthusiasts’ needs. All vendors talk about face and people recognition as if they are the same thing. They are not, because images will contain people who have been shot from an angle that does not facilitate face recognition. I need to tag the people in my images, not just the faces. To demonstrate, Moments reports that I have 473 images of my wife. Of those, at least 1 is not her. 1 in 473? Insignificant? Probably, but there is no way of correcting the entry. What you get is what you’re given, right or wrong. So, how close to reality is an FR count of 473? My manually applied tags tell me I have 1,567 images of my wife – 3.3 x more than Moments FR has identified. I’m also having a bit of an issue labelling this person that Moments FR discovered. You can dismiss suggestions like this but the method is not intuitive. 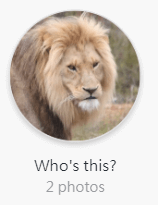 When you’re faced with a Who’s this? entry you seem to have just one option – enter a name. There’s no right click option either. To dismiss a suggestion you need to look elsewhere – top right, click on the … menu item and select ‘Show / Hide people.’ This will a display screen that looks the same as the previous people screen, except when you click on an suggested person, they will be tagged as “Unknown” and pressing “Done” will suppress them from display. You can come back to this screen to toggle someone back on. That same screen has a “Merge” option which allows you to name the first suggestion for someone, and then scan through the library for further suggestions that are the same person, and merge them. Unlike the “Unknown” tag, merging cannot be undone. For now, Moments FR will be useful for casual users with a small library but its value for photo enthusiasts is limited. [thumbsdown] Every vendor is trying to do this – analyse image content and group it by subject. It’s a brilliant concept. And every vendor struggles to produce results that are helpful. In this regard, Moments is no worse than the rest – Google and Microsoft do no better even with their massive resources. On my DS916+ 8GB DiskStation, Moments took 36 hours to analyse 25,000 images and produce 97 generic subjects such as “Beach” “Child” or “Wedding”. My photo management app contains 108 specific subjects such as “Brighton Beach” “<Person’s Name>” or “Mork and Mindy’s Wedding.” I chose the tags I wanted and applied them to 12,000 of my 25,000 images, because not every photo merits a specific subject tag. How do my categories compare to Moments’? Only three of my specific subjects correspond even remotely to the generic subjects generated by Moments. That’s a 97% miss rate. With this level of disconnect you can’t even use the suggested subjects as a shortcut to set your own tags. The accuracy of the subjects is also a problem. … and the list just goes on and on. Fortunately the Subject section is easy to turn off. It uses the same steps as described above for People. [thumbsdown] I can’t see any obvious improvements to this function in this release. So let’s look at how the functionality looks, so far. I am a big fan of geolocation. So much so that every one of my 25,000 images, dating as far back as 1904, has been updated with GPS coordinates. Sometimes the best I can do is identify a town, county or even just a country. 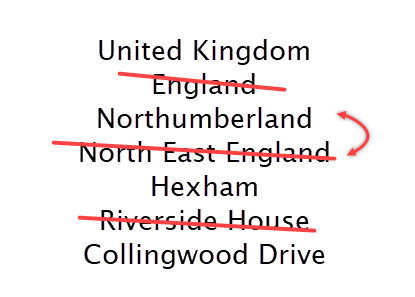 As well as visualising my library on a map, I also need to be able to locate content by drilling down through a hierarchical address using Country > State/Province, City/Town, Street address. To achieve this every image carries a keyword tag containing that hierarchy, that was applied manually by me..
How well does Moments support this approach? Well, on first inspection it seems that the need to tag files with a full address might be unnecessary, because Moments derives an address from the GPS. Except it doesn’t work very well because while it can produce labels with a high degree of technical accuracy, the results are often unrecognisable to a human being. For an example of this wayward naming convention we don’t have to look far from (my) home. There are three unnecessary elements. 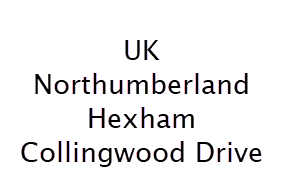 The first two are technically accurate but redundant and make the address more difficult to scan. As well as being redundant, the second redundant element is misplaced. In a descending hierarchy, the region should obviously precede the county. The third redundant element is a piece of pure fiction. I’m unable to locate a Riverside House in Hexham. There is one in a nearby village 3 miles away, by a river. It gets worse. This fictional label is applied to the woods that are 1.5 miles away from us in the opposite direction to the river. Chesters Roman Fort, 8 miles away, on Hadrian’s Wall? Its label also includes Riverside House. I see no point in a place-labelling function that doesn’t use the commonly accepted terms for places. If it was not for my manually applied keywords, a search for “Yellowstone” would return no results. That is not good. And I can’t even edit the place labels to make them useful. As an aside, there’s the question of which is more important, the camera location or the subject location. If I stand on my hotel balcony and take a photo of the pool, the position of the camera is good enough. If I lift the camera and take a photo of Mount Vesuvius, miles away across the Bay of Naples, the camera position is of secondary importance. The majority of photo apps only support one set of GPS coordinates – camera location. Therefore I always adjust that location to show the coordinates of the material subject. I don’t like destroying the original position data, but I have no choice. Neither Moments or Photo Station allow you to change the GPS data – you have to use another app to do that. I use Daminion but GeoSetter is another option. [lightbulb] So here’s the fundamental issue with using Moments’ place recognition. I can appreciate the difficulty in building an accurate address from a GPS coordinate. I would not mind editing the label to make it sensible, but I can’t because there is no edit function. And the data is not written to the image files’ metadata – it is stored in Moments’ catalog, so I can’t even edit it in an external app. Regrettably, Places joins the list of disabled features, along with People and Subjects. [thumbsdown] All of the thumbnail pages present the content in random order. When you have a large library this makes it very difficult to find individual items on a page that could have hundreds of entries. It might appeal to someone who is using Moments to organise their phone’s content though, because there will be far fewer entries to scroll. [lightbulb] I would prefer to be able to set a sticky sort sequence of “By name” “Ascending / Descending” for People, Subjects and Places.. Sharing Content is so much easier in Moments than in Photo Station – mostly. A Select the images you want. B Click the share icon that only appears once you have selected at least one image. C Enable the share link. Having to positively enable a share limits the accidental visibility of content, which is an improvement on Photo Station. D Optionally – enable the ability for the user to download the original image file. F Click OK to register to share link. [thumbsup] The link will appear in Albums > Shared, where you can edit, copy or delete it. Synology have done this really well. It couldn’t be simpler, and I doubt it could be improved on. [thumbsdown] There’s just one small issue with People sharing – you can’t easily share all the images for one person because there’s no way to select a person for sharing in one click. Instead you have to select all the images, manually. [lightbulb] I’d prefer to select all photos for a person by selecting that person on the People screen. Perhaps this feature will be added in a later release. These work in the same way as Sharing People and all are therefore subject to the same limitation when it comes to sharing an entire set of one topic. If there are only a limited number you can select the first, then hold down Shift and scroll to the end and select the last to highlight them all. But for large selections this does not work because the system appears to be unable to remember the start point. The only other way is to manually add the items to a Moments “Album” because you can then share the album, but this is tedious and seems unnecessarily duplicative. Having disabled the three auto tags, People, Places and Subjects, how do you find content quickly and easily, especially when you have a large library? 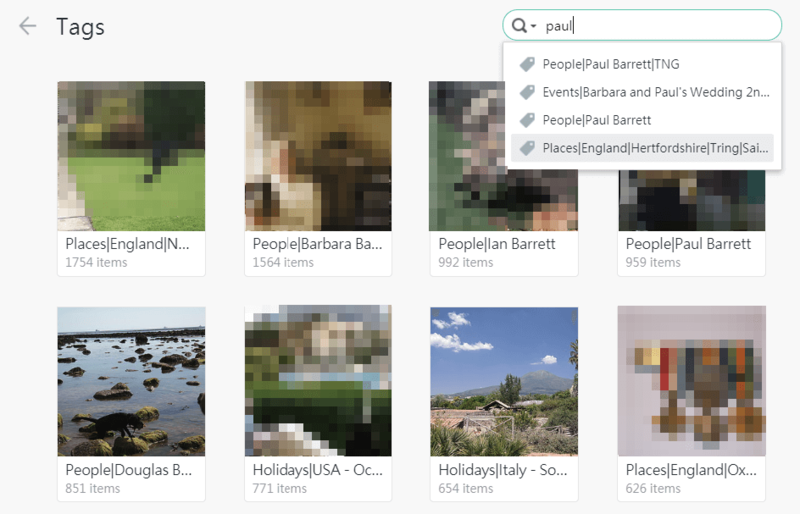 1 Use a digital asset management application to assign keywords to your images. You could do this in Moments or Photo Station but it is orders of magnitude more difficult than using a dedicated app. Having used Photo Elements and Lightroom, and found them lacking, I now use Daminion (available for Windows only) which has a free limited catalog size capability – download here. Daminion is particularly good at handling large libraries and supports hierarchical keywords which is great for organising places by country, county, town etc. Be careful to only use keyword tags in whichever library manager you use. This is the only metadata set that Moments (and Photo Station) can read and write. Be careful, therefore, to choose a photo library app that supports keywords. Most do. 2 In Moments use Search to find your content. All the images are indexed, so it’s extremely fast, and the predictive results enable you to distinguish different groups of content easily and jump to the one you want. 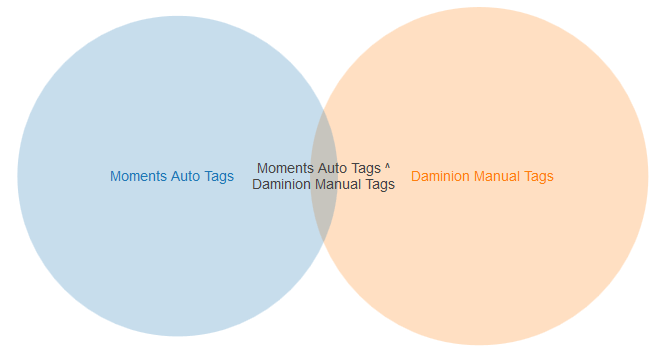 Manually applied keyword Tags accessed using Moments indexed Search will deliver useful content in a heartbeat – far better than auto tags will ever do. Photo Station has a little trick that Moments does not, and it’s shame because it’s a very useful trick. In Photo Station you can set the library up to be public by default. This means that the unique URL for any keyword can be used as a link in other programs and will seamlessly display the content that carries that keyword. These are dynamic links. Tag or untag a photo in your library and the external app will see the current content. This is what I mean by a seeded search. Using this method I can, for example, put links in our on-line family tree to photos of our individual ancestors knowing that as we discover, add and tag new photos in the photo library, they will automatically be made available to the family tree. The workaround is to place the individual photos into a Moments Album1 and create a share link to that. So now you have to discover, add, tag, add to album and edit share. That’s two extra manual steps, which are easy to forget. 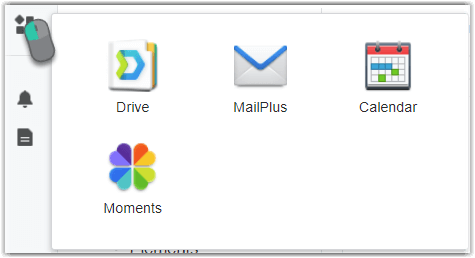 1 In Moments Synology have changed their definition of Album compared to Photo Station which is good because the latter has Albums = folders, Smart Albums = tags and Shared Albums = manually shared items,. Now Photos have a folder or timeline view and Albums contains everything else. Entering a search term to find content has one major drawback – and it’s common to all search functions on all web sites. If you don’t know what you’re looking for it can be hard to figure out what search term to use. And some people prefer to find things by navigation rather than search – not everyone is search-centric. The metadata for these is written to the files in a flat, piped format e.g. My library of 25K images has 900 keywords and counting. The only way to make sense of them is to structure them. [lightbulb] It would make navigation of the hierarchy so much easier if Moments parsed the keywords to recreate the same structure, so that the tags screen worked in a similar way to the Photos > Folder View, allowing you to quickly navigate to the content you want. All the data is present in the keywords – it just needs parsing. No control over which folders are shared means that duplicates are shown in the auto-tags. Of all the items in the above list this one could make a seismic difference, because if it was implemented I could pretty much switch to Moments overnight. I would need to find a solution to the lack of seeded searches (see previous section) but the workaround I mentioned earlier would work. Conversely, no matter how much work is done to improve auto-tagging, I could not use that until I was able to select which folders I wanted to be included in the auto-tagging process and therefore remove the unwanted duplicates. The thumbnail screens are useless as designed. There has to be a sticky option to sort alphabetically. In the context of the requirements of a photo enthusiast, how does Moments shape up? The simple answer is, it’s getting there but there is a way to go. Auto-tagging is of limited use because of inaccuracies, duplications and the inability of the user to configure or edit those out. The shared library concept is excellent, but more control is needed over which folders should be shared and auto-tagged. If Synology could fix those issues, then the more attractive UI of Moments and its much simplified sharing approach would make make conversion from Photo Station a realistic probability for photo enthusiasts. Fantastic write-up Paul. It reflects my own experience and disappointment comparing the two tools. Extremely useful and comprehensive review, It parallels my experience in attempting to make things work in Moments that just aren’t there. Let’s hope that this is a work in progress and that Synology addresses its shortcomings. But, given that it’s freeware, I’m not holding my breath either. I’ve been experimenting with Moments today and I’m disappointed. Photo Station recognised XMP face tags, and would even allow me to create smart albums with these tags (created in the amazing and sadly missed Windows Photo Gallery.) Moment’s has recognised faces but ignored my face tags although it’s read my descriptive tags, but as you say it’s flattened the hierarchy. So for me sadly, at the moment at least, it’s just another case of dumbing down.